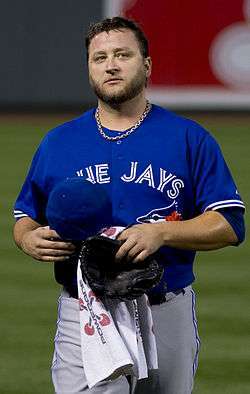 Mark Alan Buehrle (/ˈbɜːrli/; born March 23, 1979) is an American professional baseball pitcher who is a free agent. He began his Major League Baseball (MLB) career with the Chicago White Sox and started the opening game every season from 2002 to 2006 and again from 2008 to 2011. He has also pitched for the Miami Marlins and Toronto Blue Jays. Buehrle pitched 200 innings in 14 consecutive seasons (2001–2014), tying Hall-of-Famers Greg Maddux, Phil Niekro, and Christy Mathewson. He has recorded at least 10 wins in 15 straight seasons. Buehrle is the active leader in games started, with 493 as of October 4, 2015. Buehrle pitched a no-hitter against the Texas Rangers on April 18, 2007, surrendering just one walk to Sammy Sosa who was then picked off at first base. Two seasons later, Buehrle pitched the eighteenth perfect game in baseball history against the Tampa Bay Rays on July 23, 2009. Buehrle was born in St. Charles, Missouri, and attended Francis Howell North High School in St. Charles, Missouri. In his sophomore year Buehrle was cut from the school's baseball team. After High School Buehrle attended Jefferson College in Hillsboro, Missouri. He was later selected in the 38th round of the 1998 draft by the Chicago White Sox organization. He began his professional career in 1999 with the White Sox Single-A Burlington Bees. He went 7–4 with a 4.10 ERA that included a complete game shutout. He followed this up with an excellent year in 2000, going 8–4 with a 2.28 ERA for the Double-A affiliate Birmingham Barons in Hoover, Alabama, giving up only 17 walks in 119 innings. He would be named the Southern League's Most Outstanding Pitcher that season and was the winning pitcher in the Futures Game, then rated as the No. 8 prospect in the White Sox organization. In 2005, Buehrle began the season with a 10–3 record, a 2.58 ERA and a 1.11 WHIP. On April 16, he finished a game against the Seattle Mariners in only 1 hour and 39 minutes, giving up only 1 run and 3 hits (all to Ichiro Suzuki), and backed by only two White Sox runs, both homers by Paul Konerko. In the game, he threw just 106 pitches. Subtracting the time spent between innings, the game took only 63 1⁄2 minutes to play. Buehrle was selected to the American League All-Star Team, and was named the starting pitcher after Roy Halladay could not to play due to a broken leg and pitched two innings, allowing no runs and striking out 3 batters while earning a win. Buehrle's streak of 49 consecutive starts of 6 or more innings ended on August 1, 2005 after he was ejected for hitting Baltimore Orioles outfielder B. J. Surhoff. During the White Sox playoff run, Buehrle pitched a complete game against the Los Angeles Angels of Anaheim in Game 2 of the ALCS, the first of four consecutive complete games for White Sox starters. On October 25, 2005, Buehrle became the first pitcher in World Series history to start and save consecutive games, earning a no-decision in Game 2 and his first career save in Game 3 of the 2005 World Series, which the Sox swept from the Houston Astros, winning their first world championship since 1917. On July 8, 2007, Buehrle signed a four-year contract extension worth a reported $56 million with a player option worth $19 million if he gets traded. 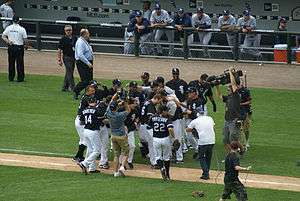 On July 23, 2009, Buehrle threw a perfect game against the Tampa Bay Rays at U.S. Cellular Field. It was the eighteenth perfect game in MLB history and Buehrle's second career no-hitter. With the perfect game, Buehrle became the 24th pitcher to throw multiple no-hitters in a career, and the sixth perfect game pitcher who had also thrown another no-hitter, joining Cy Young, Addie Joss, Jim Bunning, Sandy Koufax and Randy Johnson. (Roy Halladay would join them by pitching two no-hitters in 2010: a perfect game on May 29, and a second no-hitter on October 6, in the NLDS.) Coincidentally, the home plate umpire for both of Buehrle's no-hitters was Eric Cooper (who, coincidentally, shares Buehrle's number 56). He recorded the final out against Jason Bartlett on a ground ball to shortstop Alexei Ramírez. Earlier in the 9th inning, teammate DeWayne Wise, a defensive replacement, made a spectacular catch to rob Gabe Kapler of a home run and preserve the perfect game. Like his previous no-hitter, the game was completed in exactly two hours, three minutes. On July 28, his next appearance, Buehrle retired the first 17 batters he faced before finally allowing a baserunner in the sixth inning, setting a MLB record for consecutive outs at 45, which was later broken on August 28, 2014, by Yusmeiro Petit. Buehrle became only the third pitcher in MLB history (joining Cy Young and Sandy Koufax) to have a no-hitter, a perfect game, and a World Series title with the same team – a feat Buehrle accomplished with the White Sox in 2005 (World Series), 2007 (no-hitter), and 2009 (perfect game). On April 5, 2010, Buehrle made his eighth career opening day start, setting a franchise record. In that game he threw 7 and 1/3 shutout innings against the Cleveland Indians and also made an incredible play which involved him flipping the ball to first base between his legs with his glove. After this play, Web Gems on Baseball Tonight added the "Buehrle-Meter", in which they compare the day's best play to the degree of difficulty of Buehrle's. The "Buehrle-Meter" is used daily on Baseball Tonight and was proposed as an idea by Baseball Tonight's John Kruk. On August 3, 2010, Buehrle won his tenth game of the season against the Detroit Tigers pitching 7 2⁄3 innings allowing 2 earned runs on seven hits and striking out one batter in a 12–2 blowout. The win marked his tenth consecutive season of at least 10 wins. On November 19, 2012, Buehrle was traded to the Toronto Blue Jays along with Josh Johnson, José Reyes, John Buck, and Emilio Bonifacio, in exchange for Jeff Mathis, Adeiny Hechavarria, Henderson Álvarez, Yunel Escobar, Jake Marisnick, Anthony DeSclafani, and Justin Nicolino. On February 5, 2013, manager John Gibbons named Buehrle the number 3 starter for the 2013 season. Buehrle pitched his first complete game and shutout as a Blue Jay on July 25 against the Houston Astros, and surrendered just two hits and two walks while striking out nine. The win broke a season-long seven game losing streak for the Blue Jays. On August 25, Buehrle won for the tenth time in 2013, defeating the Houston Astros 2–1. In winning the game, he extended his streak of seasons with at least 10 wins to 13, and also ended a 7-game losing streak for the second time in 2013. Buehrle surpassed 200 innings for the 2013 season in a game against the Boston Red Sox on September 21, his 13th consecutive season with at least 200 innings pitched. He would finish the 2013 season with a record of 12–10, a 4.15 ERA, and 139 strikeouts over 203 2⁄3 innings pitched. On October 25, Buehrle was announced as a finalist for the AL Pitcher's Gold Glove, along with teammate R.A. Dickey and Detroit Tigers pitcher Doug Fister, however he would finish second to Dickey in voting. Buehrle won his first 4 starts of the 2014 season, and put up an ERA of 0.69. On May 1, he and teammate Melky Cabrera were named the co-winners of the Honda Player of the Month Award for April. In a 10–0 win over the Philadelphia Phillies on May 7, Buehrle earned his 6th win of the season, and became the first pitcher to do so in the 2014 season. In his following start on May 12, Buehrle retained his wins lead, earning his 7th win of the season by beating the Los Angeles Angels of Anaheim 7–3. After taking a no-decision against the Texas Rangers on May 17, Buehrle earned his league-leading 8th win on May 22. He pitched 7 innings and yielded only 2 runs to the Boston Red Sox, and in becoming the Majors' first 8-game winner in 2014, gave the Jays a 3-game sweep at Fenway Park and a 5–1 road trip. On May 27, Buehrle retained his lead in wins, earning his 9th of the season and extended the Blue Jays winning streak to 8 games. Buehrle began the 2015 season as the 4th starter in the Blue Jays rotation. In his first start of the season he defeated the Baltimore Orioles 12–5 and earned the 200th win of his career, joining Bartolo Colón, Tim Hudson, and CC Sabathia as the only active pitchers with at least 200 wins. He also became the second pitcher to record his 200th win in a Blue Jays uniform, joining Roger Clemens. On May 29, Buehrle threw his first complete game of the 2015 season, defeating the Minnesota Twins 6–4. In his next start, Buehrle pitched his tenth career complete game shutout, needing only 93 pitches to defeat the Washington Nationals 8–0. He earned his 30th career win against the Minnesota Twins on August 6, becoming the 21st pitcher to have 30 or more wins against one franchise since 1961. Buehrle made what many believed to be his final appearance of the season on October 2, holding the Tampa Bay Rays to 4 runs over 6 2⁄3 innings and earning his 15th win. The start left him 2 innings short of continuing his streak of 14 seasons with 200 or more innings pitched. On October 3 it was reported that he would attempt to throw the 2 innings the following day, and would retire afterward, as he did not believe he would be included on the postseason roster. In the subsequent game, Buehrle was only able to pitch 2⁄3 of an inning, after errors in the field resulted in Tampa Bay scoring 8 unearned runs on five hits. After the game Buehrle confirmed that he was not named to the Blue Jays' post-season roster, but that he had not yet made a decision about playing next season. He finished the 2015 season with a 15–8 record, 3.81 ERA, and 91 strikeouts. On October 29, Buehrle was announced as a finalist for the pitcher Gold Glove award, along with Sonny Gray and Dallas Keuchel. Buehrle throws a fastball, curveball, changeup, slider, and cut fastball. He is a command pitcher, relying more on finesse and accuracy than velocity. He is also known for being a contact pitcher, rather than striking out multiple batters. Buehrle often forces line outs, ground outs, and fly outs, with occasional strikeouts. He is considered an efficient pitcher, pitching quickly and keeping his pitch count low. Buehrle averages 15.8 seconds between pitches, which is 2.1 seconds quicker than the next fastest pitcher. Buehrle and his wife are known animal rights activists, owning four dogs and have as a result criticized NFL quarterback Michael Vick who was convicted of running a dog fighting ring. Buehrle generated controversy when he said he had, at points during the 2010 season, hoped the Philadelphia Eagles quarterback would get injured. When he was traded to Toronto, he had to leave his pit bull, Slater, behind with his family due to Ontario's ban on the breed. ↑ Zwelling, Arden (July 11, 2015). "Buehrle's reign of dominance continues vs. Royals". Sportsnet. Retrieved July 11, 2015. ↑ "Career Leaders & Records for Games Started". Baseball-Reference.com. Retrieved August 10, 2016. ↑ Major League Baseball Stats | whitesox.com: Stats. Chicago.whitesox.mlb.com (2011-01-01). Retrieved on 2011-11-15. ↑ 1999 Burlington Bees Statistics – Minor Leagues. Baseball-Reference.com. Retrieved on 2011-11-15. ↑ "April 16, 2005 Seattle Mariners at Chicago White Sox Box Score". Baseball-Reference.com. Retrieved June 1, 2014. ↑ "Extra! Extra! Sox win! on ChicagoSports.com". Chicago Tribune. Retrieved 2007-04-18. ↑ MINNEAPOLIS (AP). "Buehrle overcomes disastrous first for fourth victory". ESPN.com. Retrieved 2009-02-25. ↑ "ESPN.com – MLB – Option play: White Sox keep Buehrle, Dye, Iguchi". ESPN. Retrieved 2007-04-18. ↑ "Buehrle tosses no-hitter". MLB.com. Retrieved 2009-07-24. ↑ "White Sox keep ace Buehrle with four-year deal". ESPN.com. Associated Press. 2007-07-09. Retrieved 2009-07-24. ↑ 2008 Major League Baseball Baserunning/Situ. Baseball-Reference.com. Retrieved on 2011-11-15. ↑ Buehrle relishes All-Star homecoming | whitesox.com: News. Chicago.whitesox.mlb.com. Retrieved on 2011-11-15. ↑ De Luca, Chris (2009-07-23). "White Sox' Buehrle throws baseball's 18th perfect game". Chicago Sun-Times. Retrieved 2009-07-25. ↑ "Mark Buehrle Perfect Game. Chicago White Sox official website. MLB Advanced Media, L.P. Retrieved 2009-09-28. ↑ Just, David (2009-07-23). "Buehrle joins MLB elite with perfect game". MLB.com. Retrieved 2009-07-23. ↑ "Buehrle completes perfect game to throttle Rays". ESPN.com. Associated Press. 2009-07-23. Retrieved 2009-07-23. ↑ "Buehrle sets major league record, but takes loss when Twins rally". ESPN. 2009-07-28. Retrieved 2009-07-29. ↑ Haft, Chris (August 28, 2014). "Petit retires 46th straight to set MLB record". SFGiants.com. Retrieved August 28, 2014. ↑ Stage set for full slate of openers | MLB.com: News. Mlb.mlb.com. Retrieved on 2011-11-15. ↑ Padilla, Doug. (2010-01-02) Buehrle has a 10–10–10 afternoon. ESPN.o.com. Retrieved on 2011-11-15. ↑ Frisaro, Joe (7 December 2011). "Buehrle agrees to four-year deal with Marlins". MLB.com. Retrieved 7 December 2011. ↑ "Miami Marlins vs. Cincinnati Reds recap". ↑ "Buehrle helps Blue Jays beat Astros to end losing streak". TSN.ca. July 25, 2013. Retrieved July 25, 2013. ↑ Chisholm, Gregor (August 25, 2013). "Blue Jays reward Buehrle with ninth-inning rally". MLB.com. Retrieved August 25, 2013. ↑ "Mark Buehrle & Melky Cabrera named Honda Co-Player Of The Month". MLB.com. May 1, 2014. Retrieved May 1, 2014. ↑ "Buehrle gets league leading sixth win as Jays rout Phillies". TSN.ca. May 7, 2014. Retrieved May 7, 2014. ↑ Chisholm, Gregor (May 12, 2014). "Blue Jays power way to win over Angels in finale". MLB.com. Retrieved May 13, 2014. ↑ Chisholm, Gregor (May 22, 2014). "Buehrle wins 8th in Blue Jays' sweep of Red Sox". MLB.com. Retrieved May 22, 2014. ↑ Chisholm, Gregor (May 27, 2014). "Toronto rides long ball to eighth straight victory". MLB.com. Retrieved May 27, 2014. ↑ Ross, Jamie (June 1, 2014). "Buehrle baffles Royals for MLB-best 10th win". MLB.com. Retrieved June 1, 2014. ↑ Chisholm, Gregor (September 24, 2014). "Buehrle hits 200 IP for 14th straight year in win". MLB.com. Retrieved September 24, 2014. ↑ Chisholm, Gregor; Ghiroli, Brittany (April 10, 2015). "Buehrle wins 200th as Blue Jays spoil O's home opener in rout". MLB.com. Retrieved April 10, 2015. ↑ Davidi, Shi (April 10, 2015). "Jays' Buehrle 'Mr. Reliable' again in win No. 200". Sportsnet. Retrieved April 10, 2015. ↑ Fidlin, Ken (May 29, 2015). "Buehrle overcomes ugly first to post complete game in Jays win". torontosun.com. Retrieved June 3, 2015. ↑ "Buehrle throws CG shutout as Blue Jays rout Nats". Sportsnet. June 3, 2015. Retrieved June 3, 2015. ↑ Schlueter, Roger (August 7, 2015). "Stats of the Day: Buehrle has Twins' number". MLB.com. Retrieved August 7, 2015. ↑ Baer, Bill (October 3, 2015). "Report: Mark Buehrle to throw two innings on Sunday, then retire". mlb.nbcsports.com. Retrieved October 3, 2015. ↑ "Mark Buehrle fails to notch 15th straight season of 200 innings pitched". espn.go.com. October 4, 2015. Retrieved October 5, 2015. ↑ "Mark Buehrle Statistics and History". Baseball-Reference.com. Retrieved October 5, 2015. ↑ Bernardino, Mike (May 10, 2012). "Need a quick game? Mark Buehrle is your man". sun-sentinel.com. Retrieved May 8, 2014. ↑ Passan, Jeff (May 2, 2014). "Mark Buehrle's quick pace, slow fastball add up to a thing of beauty on the mound". sports.yahoo.com. Retrieved May 8, 2014. ↑ Lott, John (September 13, 2013). "Blue Jays' Mark Buehrle looks forward to family reunion at the ranch". sports.nationalpost.com. Retrieved June 1, 2014. ↑ Merkin, Scott (December 8, 2009). "Buehrle bids to be Cardinals manager". MLB.com. Retrieved June 1, 2014. ↑ "Mark Buehrle – Orange County Choppers". orangecountychoppers.com. Retrieved June 1, 2014. ↑ Chicago White Sox's Mark Buehrle hoped for a Michael Vick injury at times during 2010 season – ESPN Chicago. Sports.espn.go.com (2011-02-10). Retrieved on 2011-11-15. ↑ "Mark Buehrle's Family Staying Behind For Dog Slater Due To Ontario's Pit Bull Ban". The Huffington Post. February 16, 2013. Retrieved June 1, 2014.